Summertime in Glendale and Phoenix can be brutal. With temperatures throughout most of the summer in the triple digits, you can’t afford to find yourself without a working air conditioner. A couple of box fans just won’t cut it. Unfortunately, air conditioners don’t give you much warning when they’re about to break down and leave you in the lurch. They can quit at any time. Having the telephone number to a reliable Glendale air conditioner electric motor repair shop on hand, is essential to getting your a/c motor back up and running in the least amount of time possible. 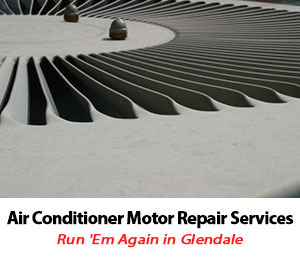 Run ‘Em Again Electric Motors specializes in air conditioner motor repair services in Glendale and rebuilt a/c motors. The a/c motor is essential to keeping your air conditioning unit running. If your electric motor breaks down, our expert Arizona technicians can diagnose it and make the necessary repairs to get it back in top working order. However, if it’s found that your motor has aged out or needs extensive repairs, we have rebuilt motors in stock, in like-new condition. Run ‘Em Again has been in business since 1946. Our technicians have the experience and skill to make the repairs you need to keep your air conditioner motor in top shape. Once your Glendale AZ air conditioner motor is repaired, you’ll lower the risk of experiencing any future problems with your air conditioner. We also have a supply of new electric motors Glendale, rebuilt motors, parts and accessories on hand for faster service. At Run ‘Em Again Electric Motors, we are dedicated to providing exceptional service in a timely manner, and we work hard to find the solutions you need. If your air conditioner is acting up, call Run ‘Em Again Electric Motors to find out how we can help you. We serve homes and businesses in Glendale, Phoenix and the surrounding areas. We also offer professional motor repair services in Surprise Arizona. Living in the Valley of the Sun comes with trade-offs. Phoenix residents rarely have to worry about freezing temperatures and snow, but with 330 days of sunshine, beating the heat can be a tricky game. Your central air conditioner is the best weapon in your arsenal. When your air conditioner breaks down, what will you do? If you call the staff at Run 'Em Again Electric Motors, you'll get fast and reliable Glendale AC electric motor repair services. Run 'Em Again is a family-owned company with more than 50 years of experience, and we bring all of our knowledge to each and every appointment. When the temperatures soar, the workload your air conditioner faces increases drastically. It is not uncommon for motors, fan blades, and other parts in the AC unit to breakdown. What are some of the most common issues homeowners across the Valley face? No longer cooling: If your AC unit is running, but your home doesn't feel any cooler, it could be a sign of numerous problems. Leaking refrigerant, dirty coils and filters, or a failed compressor could be the culprit. Making weird noises: Your AC works hard during the warmer months, so it could be forgiven for some odd clunks and clanks. However, a high-pitched squealing (for example) is a sign of a potential issue with the compressor. Higher cooling costs: If your monthly utility bills are on the rise but your kilowatt usage remains relatively unchanged, your AC unit could be losing its efficiency. Faulty wiring, poor airflow, and failed capacitors are possible culprits, though it is also likely the unit is reaching the end of its lifespan. If you’ve noticed any of these issues and feel you may be in need of an air conditioner motor rebuild, Surprise residents trust our team. If you've noticed any of the problems mentioned above, a Glendale AC electric motor repair specialist from Run 'Em Again will be happy to come out to your home and perform testing on your unit. Our techs are trained to conduct motor, branch, and pump testing on AC units, and will also check the winding and perform an overall inspection to diagnose the problem with your AC unit. For any issues requiring condenser electric motor rebuild & repair, Surprise, Glendale, and Peoria locals know we’re the best company for the job. Our family-owned business has more than 50 years of combined experience in AC electric motor repair in Glendale and the surrounding Phoenix suburbs. Call us today for a test and we'll get your AC unit firing again so you can escape the heat in a cool environment.